There’s not too much undiscovered country left in Thailand. It’s well known that the days of cheap beach holidays in southern Thailand are pretty much over. Sure, it’s cheap by comparison a beach holiday in a lot of places. But sticking to a modest budget and avoiding the well-beaten tourist path in southern Thailand was going to be a big challenge. 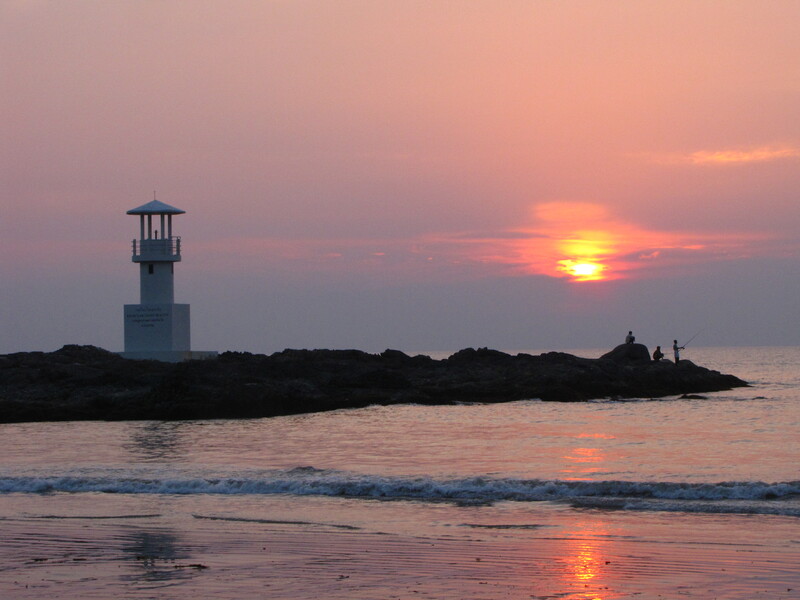 As it turned out, Khao Lak in the high season was not quite our thing. There were so many European tourists there that it was far more common to hear German spoken on the street there than Thai. The number of Speedos on the beach was unbelievable. The vibe was very package tourist. The beach was incredibly nice, but we didn’t love it. But after a few days in Khao Lak, a bit of luck led us to the Ko Ra Ecolodge, on a largely undeveloped island just off-shore from the town of Kuraburi, about an hour north of Khao Lak by bus. Just getting there was an adventure. The bus stop is about three kilometers from the Kuraburi fishing pier, so you have to meet a motorbike taxi to take you the rest of the way to the pier. By motorbike taxi, I mean you and your luggage get on the back of some guy’s motorcycle at the cost of about 65 cents (not recommended for the safety conscious). I was glad it was just a short ride. We made the rest of the way by “longtail,” a wooden boat with a deafening outboard motor improvised from a car engine and a three-meter propeller shaft that functions both as engine and rudder. When we got there, we found a totally peaceful enclave occupied by about 18 people (at the time), half Westerners (mostly Americans) and half Thai staff. The place is run by a friendly guy named Kim, who works with an NGO called Reef Check that monitors the condition of the reefs on the Andaman coast. Kim is supported by a great team of staff and volunteers who help make the place a really pleasant place to stay. The ecolodge is set up for kayaking trips, snorkeling outings, guided hikes and even yoga classes. But it’s also a great place just to relax. There is a nice stretch of beach and some really comfortable hammocks that were just made for a good book and a cold beer. Because you are basically stuck on the island for the duration of the stay, the ecolodge offers a full-board meal plan at an additional charge, which is well worth it. The food is simply awesome. The kitchen staff prepare good Thai (and, while we were there, Italian) food from the fresh ingredients available from the market and the sea. 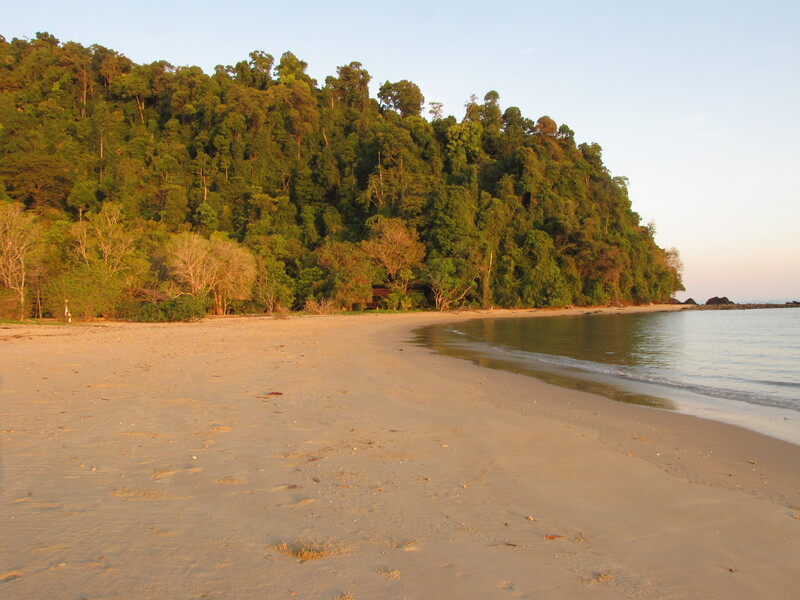 The highlight of our time on the island was a snorkeling trip out to the Surin Islands. Every time we go snorkeling, I wish that we had an underwater camera. The coral and the fish we see always blow me away. But the Surin reefs we visited on this trip were the best yet. The sea floor was completely covered in coral of every shape and color imaginable. We saw huge schools of little tropical fish whose names I don’t know. We found lots of clown fish (think Finding Nemo) darting in and out of the soft coral beds where they feed and lots of brightly colored parrotfish feeding on the coral. The cool snorkeling wasn’t just limited to the Surins; we saw some pretty cool things just around Ko Ra as well. One day we went to a reef that was badly damaged by the 2004 tsunami. There we saw a “giraffe” eel, a kind of moray with a black and white giraffe-like coloring. 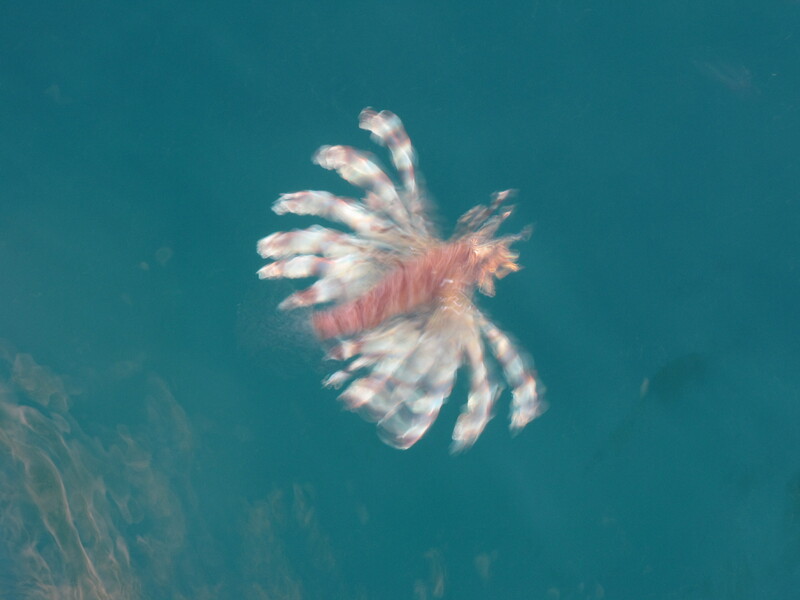 Right off the boat pier at the island was a group of lionfish. Fortunately they swim close to the surface, so I was able to take a few pictures of them from dry land. They’re amazing to see in the water, although their fins have very dangerous stingers, so you have to keep your distance! Before long, it was time to leave Ko Ra, time to start heading north toward adventures in Laos and northern Thailand. It’s very easy to see how the siren song of southern Thailand draws in so many tourists. Despite that, hopefully it will retain the culture and the natural beauty that makes it such a special place. This entry was posted in Southeast Asia. Bookmark the permalink.